Home / CRUISING THE PAST / The Princess Victoria disaster – could it happen again? Cruise and Liner History – The Princess Victoria disaster – could it happen again? 59 years ago, on January 31,1953, the British ferry “Princess Victoria” foundered in severe weather off the Irish coast. She sank shortly after 1400 local time, taking 128 people with her. 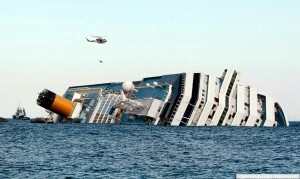 Carnival Corp’s Costa Concordia went down in calm seas. Imagine if the recent tragedy had happened in rough waters, considering the chaos of Costa Line’s evacuation of 3,000 passengers. 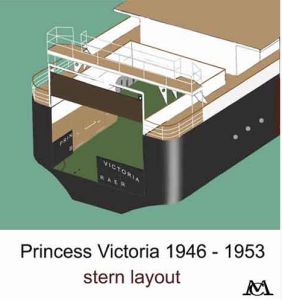 The sinking of the Princess Victoria had many similarities with the Costa Concordia. None of the officers or women and children were saved on the Princess Victoria. A video of the MV Princess Victoria. The British Railways steamer sank in the North Channel on January 31, 1953. MV Princess Victoria was a British Railways passenger car ferry operating between Scotland and Northern Ireland. She set sail from Scotland on 31st January 1953 in the midst of a violent storm. A short time later she started to take on water from the car deck stern doors causing her to list before she capsized. The Princess Victoria was built in Dumbarton in 1947 and was operated as a passenger car ferry between Stranraer and the Northern Irish port of Larne. A full blown gale was in progress when the Princess Victoria left her home port of Stranraer on the Scottish west coast on 31st January 1953. A short way into the voyage the stern doors on the car deck were breached by high seas, and despite attempts to secure the doors the seawater continued to penetrate them pouring into the car deck. She listed badly and capsized, sinking with the loss of 133 lives. Despite a storm raging not only locally, but part of a Western European-wide storm that stretched from Scotland right across to the Netherlands, the MV Princess Victoria set sail from her home port of Stranraer under Captain James Ferguson on 31st January 1953. It was to become the worst storm in living memory around the Scottish/Irish coast; it was known as the “Great Storm” in which it was estimated that 2,000 people lost their lives. With 127 passengers, a crew of 49, and 45 tons of cargo, the ship sailed down the eight or so miles of Loch Ryan. At the mouth of the Loch, she ran right into the teeth of the North Westerly gale with winds reported gusting locally at over 80 mph. Once out of the shelter of Loch Ryan, Captain Ferguson must have decided that the storm was too severe to carry on with the voyage; he turned the Princess round and headed back into Loch Ryan. However, this maneuver exposed her stern to the full force of the storm and waves forced her stern doors open allowing the sea to enter the car deck. The Chief Officer, Bosun, and a few crew members made their way along the swamped car deck to the stern and attempted to secure the stern doors, but were nearly swept away. They also tried to lower the guillotine spray door but this also had to be abandoned due to the force of the storm. The captain then decided to unpin the bow rudder and attempt to negotiate up the Lough astern, protecting the stern doors from the oncoming waves. The men went forward to the fo’c’sle head to operate the bow rudder gear, but once again the waves and wind were so severe that they were nearly blown overboard. Meanwhile, the Princess Victoria had taken a 10 degree list to Starboard, due to the build–up of seawater in the car and cargo deck. Although the watertight bulkhead seemed to be holding, the fire door had started leaking water into the accommodation. Captain Ferguson then headed back into the storm, sending out a message for tug assistance. This was transmitted in Morse by the Radio Officer David Broadfoot, the ship having no wireless or radio. The list to Starboard was exacerbated by the buildup of seawater in the car and cargo deck, due to the inadequacy of the scuppers in removing the water (later to be blamed on them being blocked by broken wood/cardboard cargo boxes). This list was also due to the cargo breaking free from the Port side and sliding down to the Starboard side of the ship. The Radio Officer kept transmitting a regular S.O.S giving different positions and asking for immediate assistance. These positions, for some still unfathomable reason were incorrect; it could have been the list or severe weather. However at noon, three wireless stations had zeroed in on the Radio Officer’s transmissions and calculated her position to be just over 7 miles SW of this, but chose to believe the position given by the Princess Victoria in her S.O.S. transmissions. The calculated position was later confirmed to be the correct one: if only! The Starboard list had now increased to 35 degrees due to water pouring into the car deck and forcing its way through the fire door into the accommodation, alarming the passengers who, fearing the worst, thought the ship would capsize. This was confirmed when the Captain addressed them over the PA, advising them of the situation, ordering them to don lifejackets and make their way to the boat deck. The next S.O.S. transmitted by David Broadfoot affirmed that she was listing badly, and that they were preparing to abandon ship. It also gave the ships position, once again incorrectly as being just off the Scottish coast, to where the first two rescue vessels were steaming towards. The Princess was in fact close to the entrance to Belfast Lough, a position confirmed when the next transmission from the ship informed the rescuers that the captain could see the Irish coast. The next transmission stated that the flashes of the lighthouse on Mew Island had been sighted. Mew Island is one of the three islands that make up the Copeland Islands just off Donaghadee on the Co. Down coast. Meanwhile onboard the stricken vessel, the order had been given to “Abandon Ship.” Most of the passengers had been assisted to the Portside boat deck using lifelines rigged by the crew and were embarking in the lifeboats. Due to the ships list the lowering of the boats on the Starboard side was impossible; three boats on the Port side got away. Alas, one full boat was broken to matchwood when it slammed against the ship’s side, ejecting the passengers into the sea. Some other passengers waited until the Princess Victoria was right on her beam end and slowly sinking. They then scrambled across the barnacle/shell encrusted keel and jumped into the sea in the hope of getting aboard a lifeboat or raft or finding a piece of floating debris. The Radio Officer David Broadfoot stayed at his post still transmitting to the last on emergency power, his final transmission being timed at 1358. As the Princess Victoria slipped beneath the waves, Captain Ferguson was last seen at the salute on his bridge, going down with his ship. None of the ships Officers were to survive, and rather surprisingly, none of the women or children passengers. The North Channel (known in Irish and Scottish Gaelic as Sruth na Maoile, and alternatively in English as the Straits of Moyle or Sea of Moyle) is the strait which separates eastern Northern Ireland from southwestern Scotland. It is part of the marine area officially classified as the “Inner Seas off the West Coast of Scotland” by the International Hydrographic Organization (IHO). In the nineteenth century, Alexander Keith Johnston’s suggested name St Patrick’s Channel had currency, but it was rejected by the hydrographic department. The deepest part is called Beaufort’s Dyke. The Channel connects the Irish Sea with the Atlantic Ocean, and was thus a favorite haunt of privateers preying on British merchant shipping in wars up to the 19th century; in 1778, during the American Revolutionary War it was also the site of a naval duel between American captain John Paul Jones’s Ranger and the Royal Navy’s Drake. It is crossed by a large number of ferry services. In 1953, it was the scene of a serious maritime disaster, the sinking of the ferry Princess Victoria. Unionist Northern Irish political leaders for decades lobbied the UK government to construct a rail-link tunnel under the North Channel, the better to integrate Northern Ireland with the rest of the United Kingdom. In August 2007 the Centre for Cross-Border Studies proposed the construction of a 34 km (21 mi) long rail bridge or tunnel, estimating that it may cost approximately £3.5 billion. In the Victorian era, engineers proposed a rail tunnel between Stranraer and Belfast. Next: Union Steam’s luxurious T.S.S. Awatea was the “only way to cross” the Tasman Sea from Australia to New Zealand in the late 1930s!